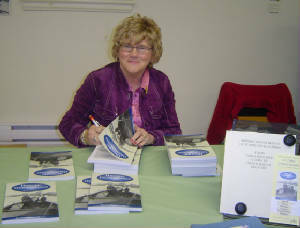 These notes are copyright and have been added to this site by Elaine Ingalls Hogg, author of the book, Historic Grand Manan. I moved away from Grand Manan, the island of my birth when I was nine. Even so, the island taught me important values that have stood by me throughout my life. My grade one teacher, Mrs. Freda Richardson, wrote these words in my autograph book, “When twilight draws the curtain and pins it with a star, remember your first teacher, though you may wander far.” Although I left my ‘home’ at a young age, my teacher taught me not to forget the people who had made a difference in my life. The light from the Ross’ Island lighthouse that swept around the walls of my bedroom each night taught me a consistent light can make a difference in the life of someone who is lost in the storm. The fog that wrapped around me like a cool blanket, shutting out the world and obscuring my direction, taught me to be quiet and listen for the foghorn when my life was in a fog. My great grandfather Caleb, sailed around the Horn seven times, yet had found no place was prettier than Grand Manan - the place I hold in my heart as being my home. Although work started on the manuscript about twenty months ago, I’ve been collecting the information for years. When I have a few minutes of time I'll add a new stories, facts, a picture or two and other notes of interest . 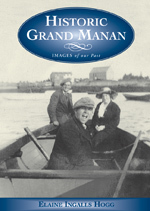 Grand Manan is where I was born and one of my vivid memories is the present my grandfather gave me the day I turned six years old. Others in the family gave me books, a yellow kitten, a pink wallet but my grandfather gave me a globe then he sat me on his knee and told me wonderful stories of my great grandfather who sailed around the world seven times. Little did I realize it at the time but the real present my grandfather gave me that day was not just a globe but the love of stories about my family and my island. Some may ask if I discovered any bad apples and I may have discovered one or two but I’ll save their stories for another day.